Because it’s nice out, I decide to go to Z’s campus midday, write in the library, and meet him after work. I have a couple of errands to run nearby, so I load up my bag with my computer, a pad of paper, five pens I won’t use, and the promise that if I don’t stop at Cupcake Royale, I’ll let myself buy something (another pen or notebook) in the campus bookstore before I get to work. I run my errands, wave at Z when I pass his office window, and make my way past the grassy expanse where a delightful array of neighborhood dogs races around, happy to be dogs outside with other dogs. This is perhaps—with the exception of Puget Sound or Lake Washington—the happiest spot in all of Seattle to me, and whenever I see well-loved and well-behaved dogs frolicking here, I pray that campus security will continue to turn a blind eye to the flagrant off-leash rule breaking because it’s good for my soul. The campus is busier than it has been all summer, and as I zip into the bookstore and see the line, I remember why: it’s the first day of classes. Of course. I won’t be buying any unnecessary writing equipment today because the queue for textbooks snakes around the store. When I go outside, it finally registers that these are students making the campus more lively than it has been for months. And then it hits me: this is the first fall in eighteen years that I haven’t had my own classes to teach. Z’s campus has never been mine. My teaching was in Indiana in my hometown. Though in my youth, I’d probably had fantasies about teaching at some tree-covered east coast college, as an adult, I never really imagined teaching anywhere else. I loved working in a place where I knew and understood the community as well as I knew myself. I loved teaching the children of people I’d gone to high school with. I loved walking across campus or running to that bookstore or library and saying hello to ten different people I’d known for years. It was my home. But I wasn’t counting on Z or how he is my real home even if his GPS coordinates and the coordinates of my hometown are two thousand, three hundred and seventeen miles apart. After we got married, I taught courses online for the same school, returning multiple times a semester for work obligations, and lived with a foot in Indiana and a foot in Seattle. It was a weird existence. When people would ask me where I lived, I had a hard time answering. In retrospect, I realize I’ve always been the sort of person who pulls a Band-Aid off a millimeter at a time instead of in a single, painful rip, and this move to Seattle has been no different. That is, until May when I resigned and began this new stage of my life in earnest. Hello. My name is Beth. I live in Seattle. 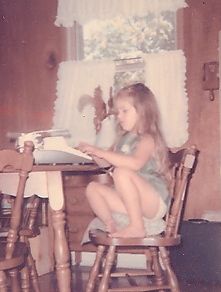 Z and I decided that if ever there were a year to discover if I liked the life of a full-time writer, this was the one. I’ve got multiple degrees assuring the world (and myself) that I am one, I’ve been writing since before I could string multiple words together, and this will be my first opportunity not to distract myself with the writing of students in lieu of doing and promoting my own. My name is Beth. I live in Seattle. I am a writer. I don’t care where you put your commas. Still, it is very strange to be walking across this campus, looking at these 19 year olds and knowing that there are no 19 year olds anywhere in the world that I am currently responsible for educating. I can’t quite name the feeling. It’s a mélange of excitement and contentment, with just a few drops of wistfulness. Two drops. Maybe three drops. I suspect one of those drops is really just wistfulness for feeling as if I belong somewhere. I set up shop in the library at a table that looks out at Mt. Rainier, when it can be bothered to show itself. Today is one of those days. I write for three hours, looking up at it periodically and stretching. Though I want to wander around the stacks and find books to lose myself in, it feels like the mountain is looking at me sternly and telling me to sit where I am and do my work. So I do. That thing has lava in its darkest recesses. Who am I to argue? At six, I meet Z outside of his classroom, and we walk to the dog lawn, where I wait for him while he runs to his office to drop off his books and papers. There is a tiny ribbon of envy I feel unfurl when a student greets him by name or I picture him in his office being greeted by colleagues or grousing with them about some overlord who is causing them grief. I’m a lone wolf now and unless I want to start randomly complaining about the publishing industry to strangers hammering out novels in coffeehouses across the city, I’ll have to save my work angst for emails to writer friends. The sun is shining. The tails of twelve dogs are wagging wildly. Z walks towards me, and we head off toward our apartment, where I have notebooks to fill and not a single paper to grade. The thing about living in a city for me is that when I’ve been away from it for a while and then come back, I almost immediately want to escape it. In case it sounds otherwise, I am not unhappy in Seattle. Sure, I miss my beloved rolling hills of east central Indiana and the lowing of cows and lack of EPCOT style shopping where I’m constantly navigating people from different cultures who have different ideas than mine about what a respectable amount of distance is to stand when you are thumping cantaloupe, but there is a lot here to love too. Eventually, I’ll cover some of my favorite things about living in Seattle, but for now, what you need to know is this: after a few weeks in Zimbabwe and the certain knowledge that being “home” would soothe my traveler’s brain, I am crazy with the desire to escape it again. There are a variety of possible reasons for this. For instance, I hate unpacking, so in many ways, it is easier to shuffle things around in the suitcase, zip it back up, and zoom off to some other place. For another, when you are home you can’t escape your obligations or your to-do list, and my to-do list is long and I am not what you would call a high octane task-completer. And finally, it is easier to forget about how uncomfortable it is to adjust back into my old life after being absent from it if I make myself absent some more. One of my oldest friends hates to leave her house. Jane is not, to the best of my knowledge, agoraphobic, but she has a peaceful sort of haven of a house and she likes being there. Other places do not pull her the way they do me. For three years now I’ve been trying to lure her out to my neck of the woods for a visit and she always politely ignores my invitations as if I never spoke. The night before one of my trips when I send her emails in all caps about how much I do not want to go on this adventure and moan about how much I just want to stay home, she is gracious enough not to remind me that this is exactly what she’s been trying to tell me for years: home is where my heart should be. On the second day after our return from Zimbabwe, in between scratching and calamine applications, I started poking around online and asking Z what I believed were surreptitious questions about how soon his Canadian visa would be ready to use. (Answer: not ready enough to make the one night cruise I’d hoped for up to Vancouver.) I didn’t want him to know that I was already jonesing to disappear for a few days when we’d only just gotten back from a pretty amazing trip. Plus, this is the first time in 18 years when I haven’t had my own personal paycheck rolling in to help supplement our trips, and though Z does not make me feel this way, I can tell already I’m going to feel less entitled to say, “I’ve got to get out of this place” right this minute while nothing is being direct deposited into our travel account. This is, perhaps, the single drawback to my year’s sabbatical away from teaching and toward writing. I needn’t have worried though because Z’s brain was pretty much in the exact same place as mine. He had a work meeting on the Kitsap Peninsula on Tuesday, and he’d already been thinking about the ferry commute during rush hour and how much easier and more fun it would be to go early and stay a couple of nights. One of the things I love about Seattle is the wealth of other places you can reach from here in under an hour. In the Midwest, where things are stretched out, an hour is going to get you to some place very similar to where you started. Here, you can go from the city to a little island or mountain getaway in hardly any time at all, with the added bonus that a lot of the getaways here involve some close proximity to water, a favorite of both of ours, which I attribute to the fact that we both grew up in places without a coast or even a navigable river. His meeting was in Poulsbo, a little town of around 9,000 that was founded by Norwegians and is very proud of its Viking heritage. It sits on Liberty Bay, has an adorable historic downtown that looks a little Vikingy, a grocery where there is a wall of licorice and other Scandinavian delicacies, a variety of gift shops including two bookstores, a variety of restaurants, and a Norwegian bakery, Sluy’s, that is a personal favorite of mine. (Their “Krunchie” is beyond delicious, though apparently most of their customers are proponents of the cream-filled Viking Cup.) 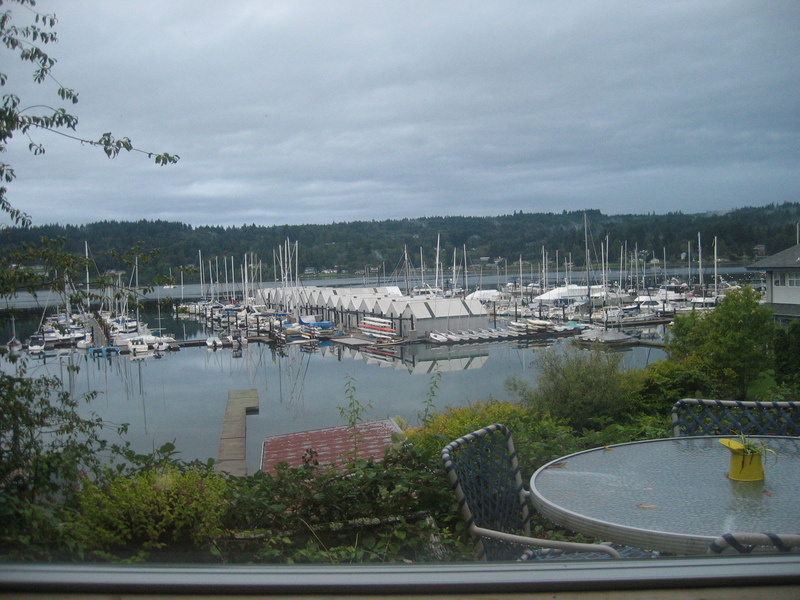 So it wasn’t hard to choose Poulsbo as our base, and when we found a little yellow cottage with views of the harbor on Airbnb.com for a price in our range, we started mentally repacking our bags. We aren’t what you would call good bed and breakfast people. (The one exception to this for me would be in Ireland; I prefer a B & B in Ireland to any hotel.) In America , we like the anonymity of a hotel, though in small towns, those are usually by a major highway and lack quaintness and have horrible views, or if they have views, we can’t afford them. So our real favorites are small cottages with a view, wherein we might meet the owners who live elsewhere and have a pleasant conversation with them, but we don’t have to talk to strangers over bran muffins or worry if we’re too noisy. Our little yellow Poulsbo cottage rental is not a disappointment on this front. The owners live in the big house and have the cottage out back for parental visits, and then rent it out when the parents aren’t in town. The owner lets us in and confesses that she rarely locks the door but we should feel free to; Poulsbo is that small town, where you don’t worry about vandals, apparently. Maybe it’s a Viking thing; who in their right mind would mess with the people who conquered big hunks of Western Europe? We chat with her and as soon as she is gone, we spread out. We’re like Thing 1 and Thing 2 in The Cat in the Hat when we arrive in a new place. Within two minutes, our suitcase has unzipped itself and what seems like all of our worldly belongings are now strewn about the place. Normally, I try to take “before” photos to show people how nice our digs are before we unleash our chaos, but because it is raining and we are damp and chilly and looking for socks and sweatshirts since we packed thinking it was still summer, there is no photographic evidence that this was initially a cozy, tidy space. The focal point is the huge picture window above the kitchen table that can be seen from the living room. It looks out on the cottage’s deck, dock and onto the marina at Liberty Bay. It’s a misty day, so the shore on the other side is dotted with patches of fog. This is exactly what I wanted. I can’t do anything in this space but read, write, and stare, because all the projects—like putting our wedding photos from 2009 into an album and stitching up one of Z’s threadbare shirts or weeding books—are back in Seattle. We check our email, hope the rain will abate, and the minute it looks like it’s clearing up, we walk down the hill to the historic downtown. This is a place we bring visitors on day trips, so we aren’t unfamiliar with the offering, but because we’ve paid for a place to put our heads for two nights it feels a little more like we belong here for the moment. The historic Luterhan church on the hill chimes and even though there are Volvos zipping past us and a lot of retired couples in Eddie Bauer rain gear milling around, it’s not hard to picture how the place looked a century ago. The city website mentions that people didn’t give up Norwegian for English until after the first world war, and it is easy to believe. There might be urban dwellers in our midst, but it really does feel like a small, self-contained village. Our destination is the bakery, where we make our selections and then sit on a bench out front and watch sparrows gather around, hoping for crumbs. I’m not normally a huge bird watcher and often have to pretend to be more interested than I am when talking to people with bird books and binoculars, but these are very young, hopeful sparrows, that almost look like baby chicks, and I want to scoop one of them up and take it home with me. I feel really selfish for not offering them half of my Krispy, but they can have the crumbs of one on almost any given day, whereas I am only in Poulsbo a few times a year. And also, I’m notoriously selfish with baked goods. Z and I saunter around the town, peering into the windows of shops that are closed because it’s Monday, which we’d probably pass over if they were open, but because we aren’t granted entry they seem more intriguing. We look for a likely supper candidate from the restaurants, and walk down to the water, at which point it starts raining hard. Since I’ve been whining about how much I miss damp weather for three African weeks, I spend several minutes attempting to feign delight, but it becomes apparent we aren’t going to outlast this downpour and the flip flops I’m wearing seem like a really dumb choice for a cold late September rain in the Pacific Northwest. We slosh through puddles, heads hung low, until we get back to the cottage. We’ll venture out later for supper at a pub, and hopefully by then the rain will be back to a drizzle. Z makes the unfortunate discovery that the rain coat we bought him from LL Bean when we were in Maine two years ago apparently had a life expectancy of only 18 months. The white lining has flecked all over his neck and shirt and he’s mostly wet. I make a similar unfortunate discovery that my rain coat, while fully functioning, has extra wide pocket openings and pretty much all the rain of Poulsbo has pooled inside them, drenching my Kleenex and wallet. We’re cold and wet and wish we’d brought a Duraflame log to put in the stove, which would take the chill off. Later we have supper at a place that boasts the best breakfast in Poulsbo. We’re the only people there and the English guy who seems to be running it zeros in on Z’s accent almost immediately and asks where he is from. Z tells him, tells him we’ve just returned from Zimbabwe, and the man explains that for several years he lived in South Africa. We chat briefly and I’m torn between wanting to know what makes people move from one place in the world to another and wanting to have a quiet dinner with Z. I opt for the latter. Sometimes the stories I make up for people are more interesting than the reality anyhow. When we leave, it’s pouring with rain again. The kind of rain I always insist never happens out here. Instead of stopping for the ice cream we’d been planning, we splash back up the hill to the cottage as quickly as we can. The cottage itself is not as cozy and glorious as I painted it earlier in the day either. We’re both allergic to something, and so we sneeze and wheeze. We want the windows open to help curtail this, but it’s cold out, so I spend the evening wrapped in a blanket most of the time and Z is having to stretch two pairs of socks into three days of sock wearing. There is no TV, which is fine, but when it’s dark and rainy, I like to warm myself by the glow of one, even if I’m not paying attention to it. We will later discover that the bed is smaller and harder than ours, and the shower is the size of a vertical coffin. Then I remind myself of the nearly identical shower set up on the Tambonette only on the houseboat water was cold and was from the lake. Suddenly I’m aware of things like how awesome the water pressure and shower head are instead. By the time we will leave, the only real beef we’ll have with the place is that both the bedroom and bathroom doorknobs have fallen off trapping one of us at various times during the stay and the other had to come to the rescue. I still have no idea why I can’t be content at home after three weeks away from it, why I spend too much of my life longing for whatever place I’m not in, but as I sit next to Z at the big table that belongs to us for two nights, both of us writing, and the boats in Liberty Bay floating in and out of our line of sight, I can’t deny I’m content right this minute. When I’ve been away from our apartment, I sometimes long for its coziness and I may even miss the hum of the city if I’ve been too long listening to crickets (or roosters). But without a doubt, there are a host of things that I forget about the place that are a shock to the system when I get back. Seattle possibly has too many people in it. 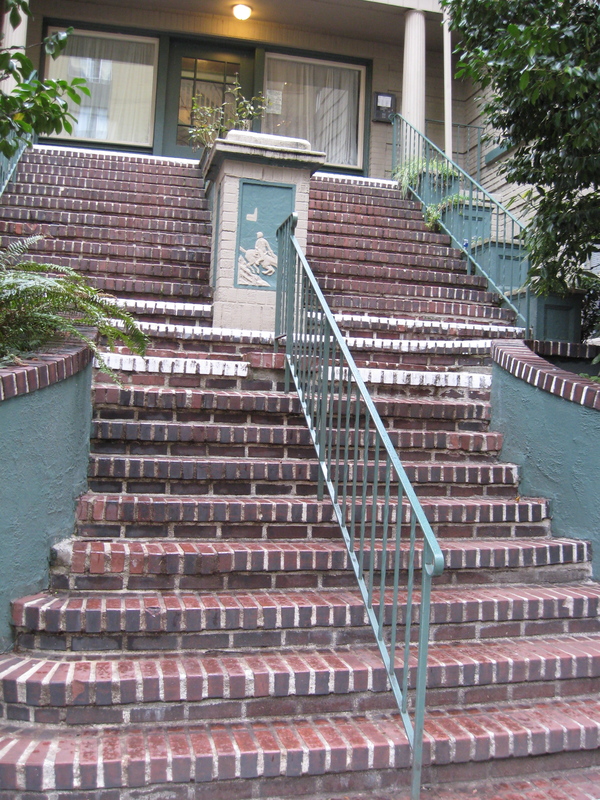 Seattle is full of hills and we live ¾ up one of the steepest ones. Despite the fact that I know where the ascent is easiest, it’s still a workout. 0ur building manager is lovely but sometimes promises things and doesn’t deliver them right away. In this case, a much coveted dishwasher. Coupled with this realization, is the harsh realization that Eunice did not travel back from Zimbabwe with us, and I am the house dishwasher since Z is the house cook. The M 303 bus idles outside our living room window five hours a day, starting at 6 a.m. depositing soot onto our windowsills and on onto our westernmost belongings. The buzzer for our apartment building is outside our bedroom window and our building mates have a lot of noisy, late night friends, pushing all the buttons except the right ones. I try to comfort myself with the knowledge that at least Amanda, the possible prostitute and/or drug dealer, no longer lives here. The buzzer was humming back in those days. We don’t have a car in the city unless we rent one, so those groceries we need must be toted up the hill (or down the hill, depending on which grocery we use). We left the apartment in kind of mess. We always do this. Departure times are a big surprise every time, and I am a time optimist. Z will be going off to teach in a few short days and it’s going to be lonesome in the apartment, just me and my computer and the screaming blank page. And then there is the weather. My first trip to the Pacific Northwest was to a writing conference in Vancouver, B.C., in 2005. While there, I took a tour of the city and ended up on the tour bus by myself with a very chatty U.S. ex pat guide. He was friendly and answered my questions about the city and his choice to immigrate. But then I made the critical error of asking if the grey, rainy days ever got to him. The temperature in the bus dropped five degrees. He launched into a tirade about other people’s views of the climate and how wrong they were. I backtracked quickly and he warmed again, but I felt like I’d learned the first lesson of Pacific Northwest Fight Club: don’t talk about the weather. It’s how people who live here and plan to stick around recognize tourists and fair-weather residents who stay only long enough to take in the geography and bulk up their bank accounts before moving to sunnier climes. The truth is, the rain here isn’t that bad. We laugh when we see depictions of Seattle, like in The Killing, in which windshield wipers are cranked up to high and everyone is drenched. It’s usually more of a delicate mist, and truth be told, I’ll be happy to feel it on my so-recently-parched skin. So I’ve done my best to abide by this code of weather silence. I might complain to Z if it’s a particularly hard, cold rain, but that’s it. Were I in Indiana, I’d be Goldilocks-ing it up: it’s too hot, too cold, too dry, too damp, not enough of a freeze or so much snow I’m thinking of moving to Florida. This is my native language.. It’s how Hoosiers bond with neighbors and strangers at the Meijer check-out. But not in Seattle. There are only three times you are allowed to talk about weather here as far as I can tell. The first is if it snows in the city. The whole place shuts down, but even so, you are amused by it—it is not cause for stocking up on bread and milk and blizzard preparation mode. It’s a two-hour anomaly. The second is if there is thunder. A single thunder clap is conversation fodder for days. There is, I think, a one-week window here wherein you are allowed to complain about future weather even though the minute the rain starts, you will be so busy pretending it doesn’t exist that you won’t even carry an umbrella. 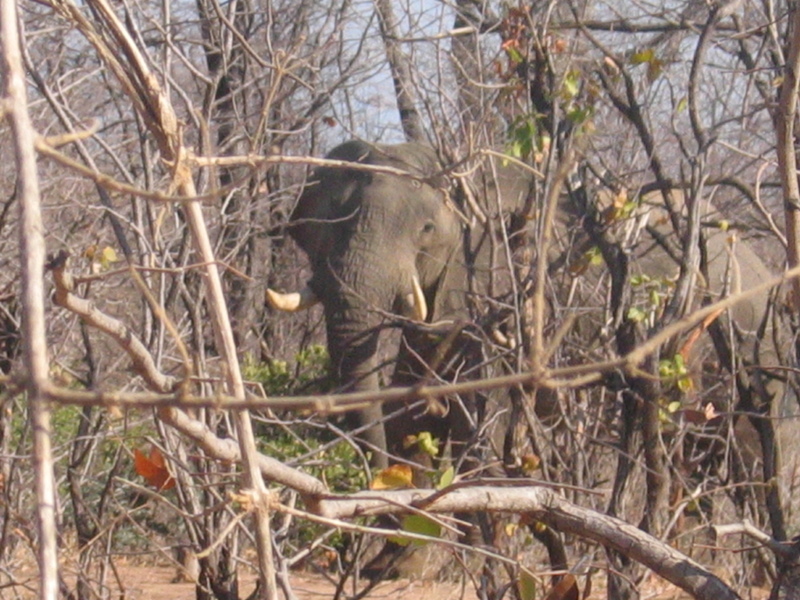 My two expressed goals for this trip were seeing Z’s family and friends and seeing elephants. We’ve done a decent job on both fronts, though there might be two elephants I didn’t get to see, and there are definitely some family members we missed on this pass, which makes me feel a little forlorn. Growing up as an only child in a single-parent home, I had a lot of big family fantasies, many of which were spurred on by shows like The Waltons, The Brady Bunch, and Eight is Enough. More just seemed better to me. Happier. Safer. Plus, with my fantasy family, I never imagined how much siblings or an extra parent or ill-behaved dog would work my solitary nerves. Even so, I was surprised to discover that one of the perks of getting married was that I got this whole set of extra people in my life. Because bad in-law stories are so much more entertaining than good ones, I’d kind of always assumed that in-laws would just be something to endure. But now, three and a half years into this marriage experiment, I realize that it isn’t this contentious “my family vs. your family” scenario every rom-com I’ve ever watched has set up for me. It turns out I actually like these people. It turns out, they don’t feel like Z’s family. They just feel like family. Period. Who knew? The downside to this is that though I will be happy to get back to reliable lights and water, I am not happy to be saying goodbye. Surely we just got here. Z packed our bags the night before (we’re down one and much lighter, and this makes me feel more satisfaction than I should given that we’ve still got three checked bags and two carry-ons), which frees me up to walk around Z-ma’s doing a rendition of Goodnight, Moon to the house. Goodbye excellent shower room where no shower curtain grabs me. Goodbye mozzie net. Goodbye, you gecko that barely made yourself known this trip. Goodbye bedside rose. Goodbye bookshelf with Z’s childhood books on it. Goodbye writing desk and stone tortoises. Goodbye cozy lounge with sofa I find it impossible to get off of. Goodbye dining room with dual tables. Goodbye cleverly designed kitchen with half-wall that hides dirty dishes. Goodbye Eunice. Goodbye real tortoises. Goodbye horrible blue-headed lizard. Goodbye annoying neighbor rooster. Goodbye flowers. Goodbye Skampy. It helps a little that our flight is not until the evening and so Z, Z-ma, and I are headed off to have lunch in Harare and a visit with Z’s brother. We still have time. First, however, we stop at the shops to check on Z’s shoes. Z wants to get on the road and has given up the hope of collecting them, but the women in his life insist he check. He shakes his head and leaves us to wait in the truck. I look back at Z-ma and confess that though I’d be happy for the shoes not to be there so he’s forced to buy a new pair, he’s so certain we’re wrong and this stop is pointless that I want the cobbler and his shoes to be waiting on him, so there will be proof that he should listen to his wife and mother. He’s back in what seems like seconds without the shoes. There’s no sign of the cobbler, who apparently really is in the rural area, cobbling his heart out. Either that or he’s wearing Z’s shoes on some new adventure. Goodbye Z’s hometown. Goodbye makeshift car wash that is just a bucket and rag in the middle of a field. Goodbye old man by the highway who makes sitting in tires look better than a barcolounger. Goodbye airtime seller shouting, “Gogo! Gogo!” as we pass. I’m sorry; we don’t need airtime today. We drive up the dual carriageway and are mostly quiet. We check the hills to see how much damage the fire we saw the other day did. The entire hill has been burned, but already you can see sprigs of green poking through and Z assures me the trees are hearty. It seems a little like a metaphor for Zimbabwe, always making a plan to recover. The drive is too quick and I don’t have the heart to snap the photos I’ve been planning. There are images I want to capture to show people at home, but instead they’ll just have to imagine the crowded mini-buses, the people—usually women—carrying impossibly huge loads on their heads (including suitcases), the hilariously named Snake Park Service Station and Immaculate Heart of Mary Catholic Church: Snake Park, the insane roundabout that follows no rules of roundabout driving, the jacaranda trees that are just starting to sprout purple, the house that looks like Z-ma’s with cattle grazing in the yard, the Thingz sellers. We coerce Z’s niece to have lunch with us. She’s home from college in South Africa, and today she has already eaten lunch, but she manages to eat a slice of carrot cake, while we eat at Spring Fever, a restaurant off of a very English looking Rowland Square. Even the light posts look like they belong in London. She’s happy to be home and we’re happy that we’ve gotten to see her on this visit. It seems impossible to me that the girl who announced she would be a bridesmaid in our wedding and she would wear a blue dress, is all grown-up now. While we’re eating lunch, chatting with her and with Z-ma in this lovely courtyard with a fountain and flowers, it’s easy to pretend we aren’t going anywhere. And then it’s time for the hard goodbye to Z-ma, who has to drive off to her teaching job. I like this goodbye the least, though none are my favorite. (Well, maybe the blue-headed lizard. I really did not enjoy it.) Z’s family aren’t weepers and so, though I want to, I force myself not to. “Talk to you soon,” we say. And she drives off. We spend the afternoon in the lush garden, where, again, I’ve had to resort to soaking my mosquito-tortured feet in a bucket of ice-cold water. That’s what this trip has done to me: turned me into a woman who has to soak her feet. My brain, which is slightly agitated from the itching, is already trying to negotiate with imaginary flight attendants about why I must have a bucket of water for the entire flight. I’m pretty sure there is a pout on my face while I sit there, soaking, and I’m pleased when Jack the German Shepherd comes out and sits beside me. And then we’re loading Z’s brother’s truck with our stuff, hugging everyone, patting six dog heads, and we’re off. Goodbye beautiful garden. Goodbye Devil Dogs. Goodbye lovely house. Goodbye Master Chef South Africa—I wonder who will win you in my absence? Goodbye sister-in-law. Goodbye nephew. The drive to the airport takes awhile. I sit in the backseat with my niece while the Z brothers sit up front and do their last bit of talking. The roads are congested and the traffic erratic. At a traffic robot, a vendor walks buy selling bags of Thingz, and I have an urge to give him all the money in my wallet so I can have Thingz to last me until Christmas. I feel pleased with myself when we get to a particular neighborhood that I am able to identify as the area where Z-ma grew up. The road to the airport is one of the best in the country. We zoom along it and I almost feel like I’m back home. It’s smooth and pothole free. The downside to this is that too soon we are at the airport, unloading our bags, saying our final goodbyes. Goodbye brother-in-law. Goodbye niece. Like most things in Zimbabwe, the queue to check-in seems inefficient. There are six agents, but only one of them seems to be working and he is not really committed to getting us through the line. We’re glad we’ve come extra early. A Dutchman stands behind us and tries to engage us about how little luggage he has and how much luggage “they” (the people in front of us) have. Though I have no idea if the people in front of us are from Zimbabwe, I feel protective of them and their need to travel with so many bags. Plus, they’ve only got a few more than we do. So I ice out the Dutchman and stare straight ahead. The president’s photo looks down on us as we wait. Eventually, the other five gate agents snap to attention and we’re quickly processed. We go to security and the place is nearly deserted. One man stands at the desk to check our passports, and confesses that he was about to go on break, which will leave the line of people behind us, including the Dutchman, to stand around waiting for him to return while we’ve scoped out a primo spot in the waiting area. We buy one last bag of Thingz and two Cokes and begin the waiting. I prop my feet up on our carry-on luggage and try not to scratch, while Z peppers me with questions about what my favorite thing was and what I’m looking forward to about going home. We play this game with each other whenever we travel, sorting our memories into piles, holding them up to the light, and picking our favorites. Our flight begins to board, but we stand back as long as we can. Above us is the glassed-in arrivals walkway for all inbound flights, and though we’re almost certain we won’t get to see the friends who are returning from the medical tests in Johannesburg, we sure would like to. As soon as the first class passengers start to board our plane, the passengers from the Johannesburg flight start shuffling out the doors. We look at each other, cross our fingers, peer at the deplaning strangers for signs of Z’s friends. The elite members of our flight board, and still more Johannesburg passengers deplane with no sign of our friends. Maybe we’ve got it wrong. Maybe this is not their flight. The rows just ahead of us start to board our plane as the last de-planing passengers above us make their way towards the doors that lead to immigration, the doors we were entering three weeks ago. We sigh. Our rows are called. And then, the door above us swings open and a man is pushing a wheel chair with a woman in it and behind him is another, younger woman. We start waving and shouting like maniacs. The wheelchair pusher sees us and starts waving enthusiastically and then indicates to his passenger that she has fans. Her daughter sees us. 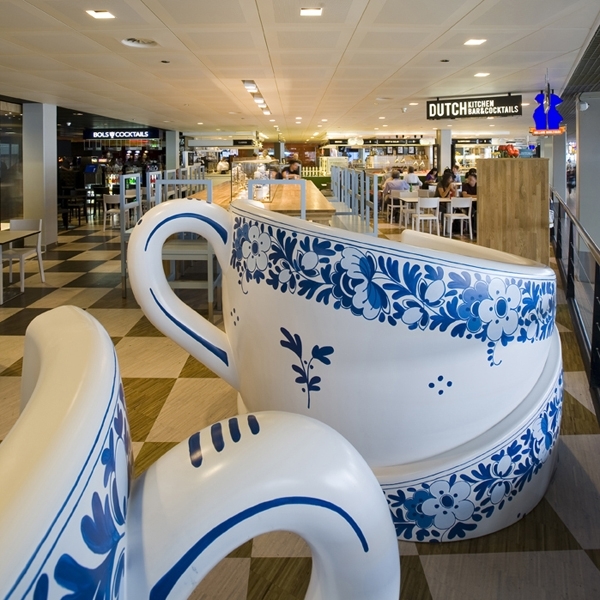 We’re all, the five us, waving and shouting, “Welcome home,” and “Have a good trip!” They go through the big doors to immigration and we join the dwindling line of passengers boarding our flight to Amsterdam. It is, perhaps, the best departure I’ve ever had. Since moving to Seattle, I’ve had to rethink walking because we didn’t bring my car with us. Back home in Indiana, walking is something you do to get from your car to your mailbox. If you are super health conscious, you might go on walks around the neighborhood or at the mall with other “walkers,” but walking is usually a choice and rarely a mode of transportation (and if you are going to do it right, you’ll need special shoes!). Seattle, on the other hand, requires walking. Even if you do have a car, parking is so tedious that you’ll be walking to get to your destination unless you drive to the suburbs where parking spaces abound. This summer when I broke my toe for vain, lazy reasons (pretty shoes and a short cut I shouldn’t have taken), I discovered how important it is to keep feet happy and healthy now that I’m an urban dweller. If you don’t, you’re quickly relegated to shut-in status. That said, a big city like Seattle offers plenty of transportation options (buses! ferries! water taxis! street cars!) to get you where you need to be. Zimbabwe, though, sheds a whole new light on walking. For the majority of the population this and mini-busses are simply the only way to get from Point A to Point B. There is no choice. No moral superiority about your decision to live car-free or how small your carbon footprint is. You just do it. Z’s family, fortunately, is a car family, so I’ve been able to cover a lot of terrain here, even if it is on the “wrong” side of the road. If they were a walking family, I’d be in the ER because of my uncalloused feet and inability to handle the sun shining on my head for extended periods. 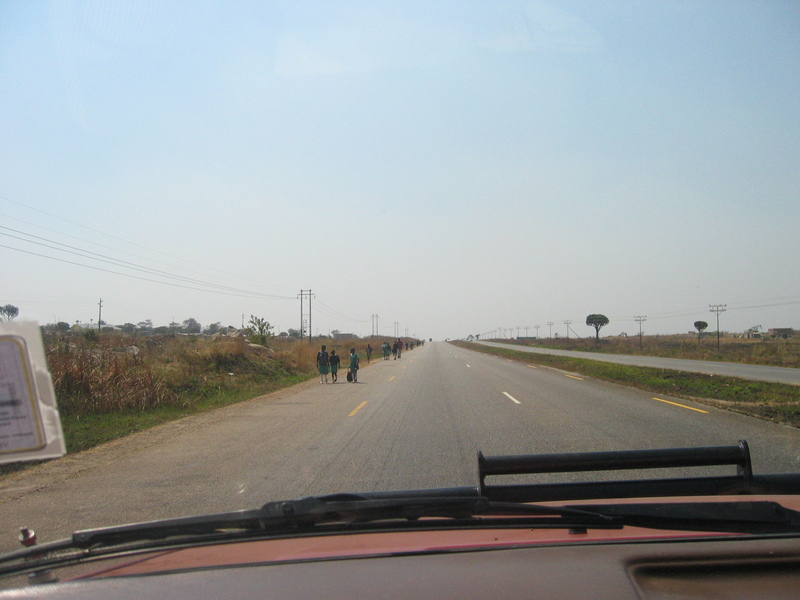 The first time I was on the dual carriageway between Harare and Z-ma’s house, I couldn’t quite figure out who all these people were walking on the dusty sides of the road. Had a concert or sporting event just let out somewhere? (At home, people walking along a road like this have either had car trouble so you should stop to help, or they are up to no good and so you should hit the gas.) I’d squint my eyes and stare at the people we passed: school kids in uniforms, men in dress pants and shirts, women in skirts with babies strapped to their backs with toweling, devout members of the apostolic sects here that are dressed completely in white that–despite the dust and the hours they spend seated penitently on rocks—seems to stay pristine, small children who look barely able to stand toddle after their mothers, mindful of the traffic that whizzes past them. And the footwear? Definitely not expensive European engineering like my feet require if I’m to do any serious walking. In many cases, people are barefoot and seem completely oblivious to the pebbles, though I am regularly plagued by them. So on our last day in his hometown when Z and I find ourselves at home without the truck, we decide to walk down to the shops to pick up a few items to take back to America and to check on the status of the shoes he’s having mended by the cobbler. It’s warm and the tree canopy between his house and where I know the turn off for the shops is looks nonexistent. Winter has just ended, after all, so things haven’t greened up yet. He says it’s a ten minute walk, but I can tell from looking it’s going to take me a half hour. He suggests I stay home and he’ll run our errands, but despite all the things out there—including mosquitos and stray dogs of dubious temperament—I want the experience of really walking for something I need. Z may be a native of Zimbabwe, but we both look like two big, pale, sweaty Americans after ten minutes. We both have on our “Life is Good” caps that I bought for our honeymoon at a garage sale, sunglasses, the pastiness that comes with a layer of sunscreen, and athletic shoes. The people we pass are just dressed for whatever the activities of their day require—they don’t have special walking costumes like the ones we’ve fashioned. It’s a straight shot from Z-ma’s house to the shops, and so we walk and talk. Past Florence Nighten Girl’s School, past the Mimosa Flats that were built for workers at a platinum mine some years ago, past houses that used to belong to the neighbors of Z’s childhood but now belong to strangers, past the houses that are late additions that fill up the space that used to be where Z and his brother caught butterflies. The only thing that kind of riles him is the amount of litter that lines the road. In some places, it appears that every empty chip packet and soda bottle in the country has found a final resting place along the street of his youth. Our first stop at the shops is the cobbler’s little hunk of real estate against the back wall where we hope to collect Z’s teaching shoes. The big question in our minds is not will he be there but will the shoes be ready and wearable. So when we turn the corner expecting to see his little bench with tools and Z’s shoes, gleaming in the sun, we’re a bit surprised to see that a thatched awning with a pool table underneath it is sitting approximately where the cobbler was when we dropped the shoes off. In the few days since the shoes were handed over, an entire structure has cropped up and the cobbler has been displaced. Z scratches his head. We look around and see no sign of him in any other recess. Hmmm. We stop at the shop that the family friends own and mention that the cobbler isn’t on his post. Z’s friend says, “Oh, he packs up and goes to the rural area to mend shoes sometimes. He’s usually gone a few days. Maybe he’ll be there tomorrow.” Tomorrow is it. We leave tomorrow. Z may be getting those new shoes I’ve been pushing him towards after all. We visit briefly and asking after the friend’s mother who is “down south” undergoing some medical tests. She tells us that the results were good, and we rejoice, and then we instantly lament the fact that we won’t be able to see her before we leave. She and her other daughter arrive at the airport around the same time we’ll be departing. We say goodbye and head off to the grocery to pick up a few items, and start the walk back home. For the most part, as we walk under that big, hot sun, no one speaks to us. One person nods. Another says hello, but on the whole, we pass people and it is as if we are invisible to them. This is something that has consistently seemed odd to me on this trip. When I first met Z, he told me how friendly Zimbabweans are, and because of this, when we are driving and pass someone on the road (which is often), I lift the fingers of my left hand in that most Midwestern of road waves. Here, no one waves back, and eventually, I’ve not only quit waving, I’ve also quit making eye contact with the people we drive past. It reminds me of the transition I made from small, liberal arts Christian college where you couldn’t walk three paces without someone smiling and saying hello, to a big state school for my graduate program, where I once said hello to someone and nearly scared them to death, so rare was it to be greeted by a stranger. Eventually, I quit attempting friendliness there, and I’ve done the same here, at least with total strangers. When we are halfway home, a group of school children, still in uniform, sees us and stares. One brave soul says in a small voice, “Good afternoon,” to which we reply, “Good afternoon.” Another little voice and another pipes up until it is a chorus of good afternoons. And then the giggling starts. It effervesces. I don’t need an explanation for it because it is just a lovely moment shared between strangers. Though when Z gives me one possible interpretation once we are out of earshot, I am surprised. It’s conceivable, he says, that we are the first white people these children have spoken to. This is something I hadn’t considered: myself as exotic animal, worthy of looking at or speaking to just by nature of being something different. I’ve never imagined myself as the impetus for a childhood dare: you say something to them! No. You do it! This is something to add to the list of my own new experiences. By the time we reach the gate, I’m hot. All I can think about is peeling off my walking layers and pouring some water over my head. Frank, the gardener, latches the gate behind us as we greet him and rub Skampy’s ears. Frank looks at me, beads of perspiration on my forehead, and says, “It’s very hot today!” Frank is not breaking a sweat himself, even though he has been outside trimming roses. We take our purchases into the kitchen where Eunice is working. She takes one look at my big red face and makes a tch tch sound. “It’s very hot today!” she says, disapprovingly. This is the kind of Zimbabwean friendliness that I have come to love here, which is different than the friendliness of strangers. Neither of them is smirking. Neither of them is making me feel like it is my fault that I’m too out of shape from my life of Seattle bus riding and Indiana car riding to walk ¾ of a mile under a sun that is not really blazing at all. Neither of them seems to be condemning me for the soft life I lead. Instead, Eunice and Frank seem almost apologetic that Zimbabwe has made my cheeks so red and my forehead so sweaty. And also, everyone seems to have genuine concern about the plight of Z’s AWOL shoes. In no order of importance, here are some images and vignettes of things I love in Z’s homeland. You’ve already had tea with Skampy and met his family and the wildlife, so don’t look for those here, though they are all at the top of the list. Much of African culture venerates the elderly, which is probably something Western society could benefit from. One of the manifestations of this is that in Zimbabwe senior citizens can move to the front of the queue. This has been particularly helpful to Z-ma when she has to get a new passport or driver’s license. The lines can snake around the likes of which I’ve only seen at amusement parks when a new, terrifying ride has opened. Z-ma delights in her ability to slap down her move-to-the-head-of-the-line trump card. Most places recognize and honor this, but sometimes the cashiers at TM are less inclined. Often, the lines there are not that long, and my preference would be to stand in them because I don’t like to cause a fuss. But Z-ma happily announces to the cashier that she should be allowed to move to the front of the line, and if the cashier balks, Z-ma says forcefully, “I am a senior citizen. This is the law of Zimbabwe!” Z-ma is a school teacher. You do not question her authority. She moves to the head of the line and I slink into the background as best I can because I just know people are looking at me thinking, “You aren’t a senior citizen. Why are you allowed to go in front of me.” But honestly, I’m just carrying the TM bags. I swear. It turns out there is a lot not to know about Thingz. For instance, I don’t know what these are other than a crunchy corn snack. 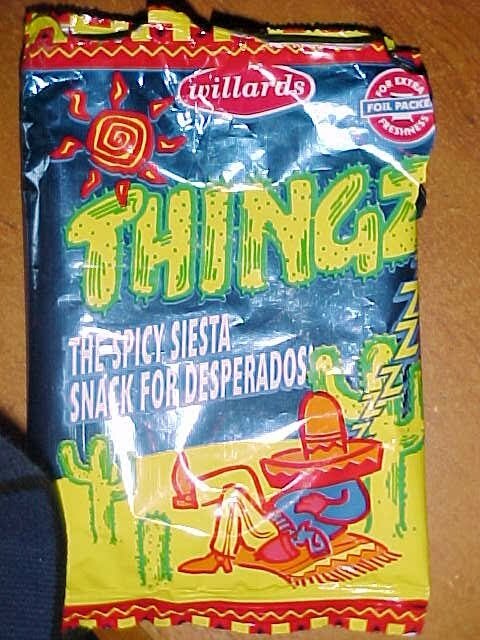 I don’t know why a Zimbabwean snack brands itself with someone dressed in a poncho and sombrero with the message “The Spicy Siesta Snack for Desperadoes.” I don’t know who got the bright idea for guys to sell these in the streets with newspapers and air time, nor do I know who rolls down their car window and buys a bag from a street vendor (though I think the packaging might make them impossible to resist—so blue, so yellow, so shiny!). I don’t know what it is about them that made the bag become magically vacuum sealed on the flight back to America. Most importantly, I don’t know why some American company hasn’t started importing these babies. They’re just that good. Because of the amazing climate in Zimbabwe (read: too warm for me, but really not as hot as you are probably imagining Africa is), there seems to be a consistent array of fruit growing in Z-ma’s yard. While here, we’ve had mulberries, pawpaw (papaya), and oranges. Soon, there will be bananas and peaches. 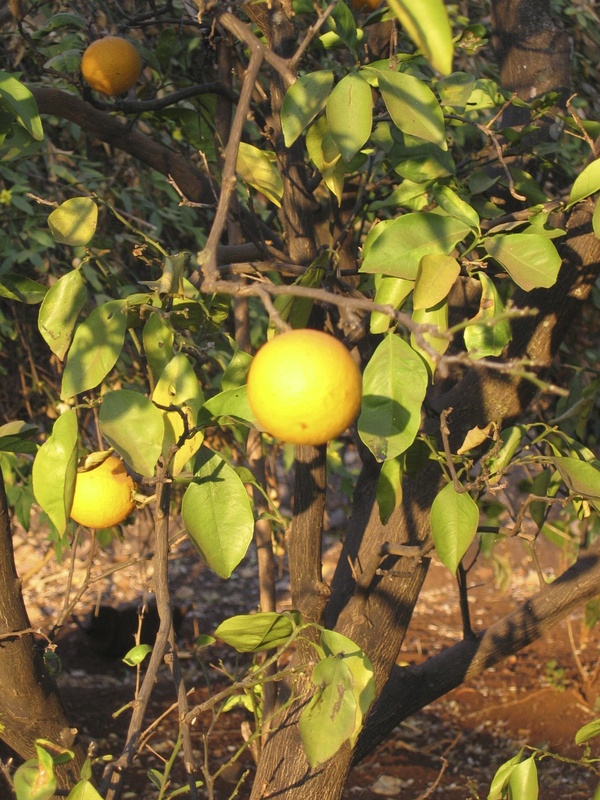 Later there will be mangoes, and lemons. And this is to say nothing of the vegetables. Generally speaking, I’m so busy devouring Thingz and Z-ma’s excellent cooking that I forget to eat fruit, but the thought that you can walk out your door and pluck breakfast from a tree all year round is pretty amazing. Mini-buses (or commuter buses) are a significant mode of transportation. A lot of the people walking that we pass when we drive into Harare are waiting to be picked up by one or have just been dropped off. They look to be built to hold about nine people if strapped in by American safety standards, but in Zimbabwe, the buses are packed full. I get claustrophobic just looking at one as there seems not to be an inch of space. If I imagine being on one, I instantly think of breathing apparatus I’d want with me (a SCUBA tank or at least a bendy straw) to ensure I get my fair share of oxygen. As much as I don’t want to walk very far, I want to ride in one of these even less. Aside from being crowded and the frequency with which they are targeted at roadblocks by the police, the driving is often dubious. These are vehicles on the road from which you try to keep some in no small part because of the erratic driving. To combat hyperinflation a few years ago, Zimbabwe adopted the U.S. dollar as its currency. (This helped curb the 6.5 sextillion inflation rate that was recorded in late 2008, and made it easier to buy a loaf of bread because Z-ma no longer had to take millions and millions of Zim dollars to the store.) Until this happened, I had no idea that a country could just decide to start using U.S. dollars. I still have no real idea about how it is that Zimbabwe gets U.S. dollars to use, because I thought when U.S. money got too tatty, it was sent to Fort Knox and incinerated. 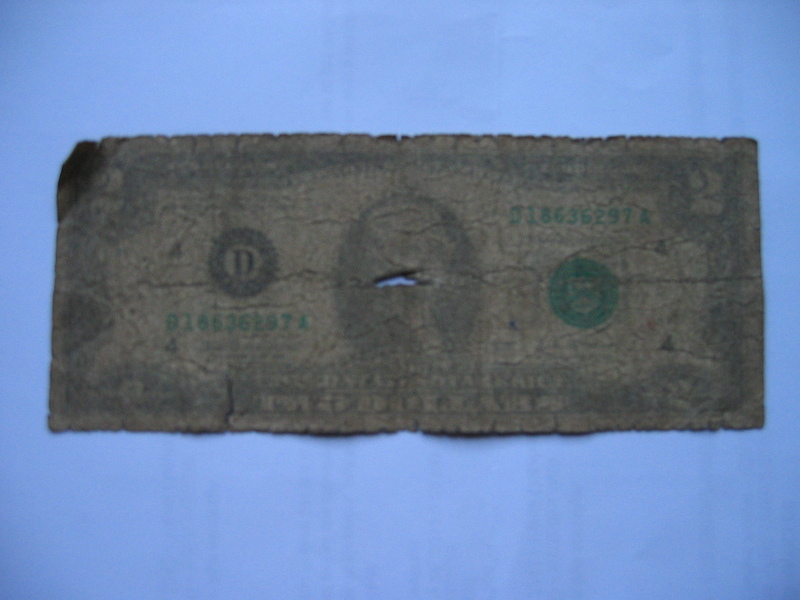 But apparently not because this is the nastiest, limpest, dirtiest, most torn and nearly indecipherable bunch of bank notes you have ever seen. I defy any of you to take a dollar out of your wallet and try to make it look like this. The first time we visited this café, I confess I was in it for the internet connection and could have cared less about the food, the gift shop, or the ambience. As soon as we pulled up, I was surprised to see a man guarding the parking lot in khaki safari outfit complete with pith helmet. He stands outside the place, watching your vehicle to make sure no one interferes with it, and then he directs you as you reverse onto the road. For this service, you give him a tip of a couple of those tatty US dollars, and it is money well spent. Inside the terracotta colored walls that keep you unaware of the traffic outside, there is house/gift shop, and a lot of outdoor seating under the trees and on the verandah. The grass is like a thick carpet and all around it they’ve placed objet d’art that you can buy in the gift shop. My favorites this time are a bunch of little metal hedgehogs that appear to be streaming through a tunnel, as if they are in a hurry to get somewhere. There are also metal chickens, butterflies, and song birds nestled amongst the sofas and tables that are scattered on the grass, as if having such furniture outdoors is perfectly normal. 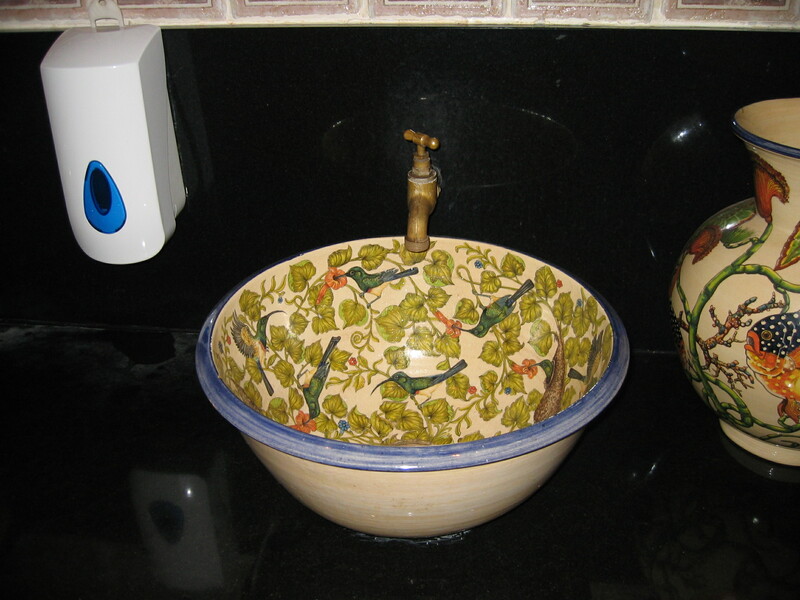 The other thing I love here is the sink in the ladies’ loo. It’s too beautiful to be there purely for hand washing. Perhaps what I love most about it is that I’ve been there enough now that I feel like a regular, which is a good way to feel when you are in a land that isn’t your own. When I mention that I’m being plagued by mosquitoes, more than one person innocently asks if I’ve tried the insect repellent Peaceful Sleep. Not only have I tried it, I apply it regularly. Even so, my ankles and legs are covered with approximately forty bites. From a single night in Z-ma’s lounge without long pants. When I am itching, it annoys me, but when I am not, I appreciate the sincerity of their belief. In America, I loathe the idea, but here and in Ireland and England, I’m forced to admit that the kids just look smarter when they’re dressed in uniforms. The news Z-ma gets is France 24, a sort of French version of BBC news that that is presented in English primarily by Irish newscasters. While I’m here there is a lot of American saber rattling because of the situation in Syria, and it is interesting to hear the news from a perspective that is ever so slightly more critical of U.S. foreign policy than I would be hearing at home. It’s subtle, but it’s different. And also, I will never understand centigrade. All the years I spent learning the metric system in elementary school because the U.S. was supposedly going to convert were a waste. Not one piece of info aside from “based on ten” latched onto my brain cells. I have a better memory of the cartoon characters in the textbook that were meant to promote metric learning than of the actual calculations. I gather thirty is hot, yet when I hear it, I wish I had my fleecy boots. Zimbabweans are famous both for using the phrase “make a plan” and for actually doing the plan making. Americans might use some version of this phrase and they are masters of planning parties, planning their finances, and planning escape routes, but this is different. In the US, it’s about the future and how to keep things safe and secure. In Zimbabwe, it’s more about making a plan to deal with something unexpected that has arisen. Z used this phrase for the first time when he proudly told me that he’d made a plan during a particularly bad water shortage to water the parched garden with used bathwater. 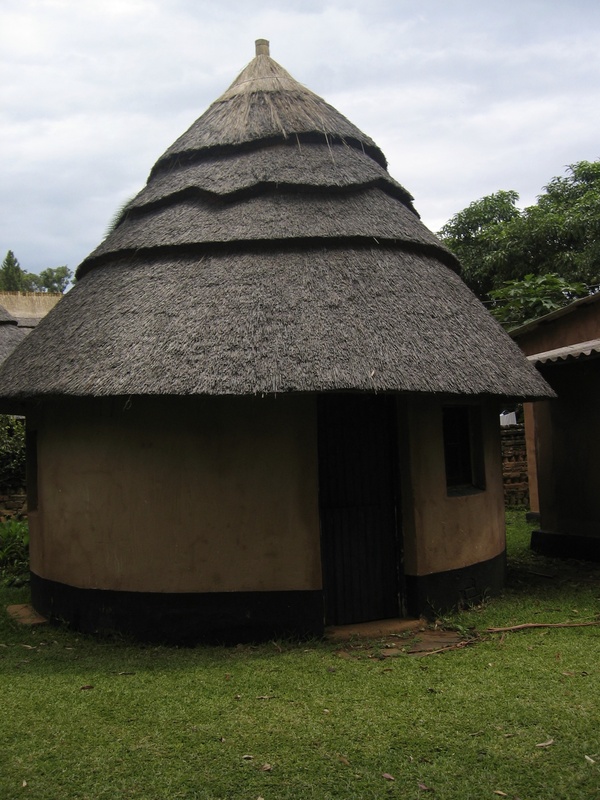 Z-ma’s house is testament to Zimbabwean plan making: if the electricity goes out, there’s an invertor that relies on a car-like battery that offers enough power for a light and her television. The act of taking a shower involves plan-making so elaborate that Z and I won’t take one until we get the nod from her: the geyser (water heater) has to be turned on so there is plenty of hot water, but then you have to judge when the city water was most likely to be on so you can cool the scalding water enough to shower. If the water is not on, then you have to consider a bath that has been cooled with fresh water that is kept in buckets lining the walls of the bathroom. Making a plan is essential if you want to survive in Zimbabwe. Z-ma has three tortoises in her yard. One is a great big strapping fellow who greeted me last time with this quick parade around his pen, as if he were saluting me. On this visit, he mostly stays in his shell, but I’m not feeling too bitter about this because apparently tortoises aren’t very active in winter. The second tortoise lives with the larger one and is medium sized. It reminds me most of the ones I grew up with. It’s shell is kind of roundy and marbled. And then there is the latest addition. A tortoise so small that her name had to be Tiny. For Tiny, multiple plans have been made to ensure her survival. Her pen is closest to the house and has a cover over it so no bird of prey will swoop down and grab her. 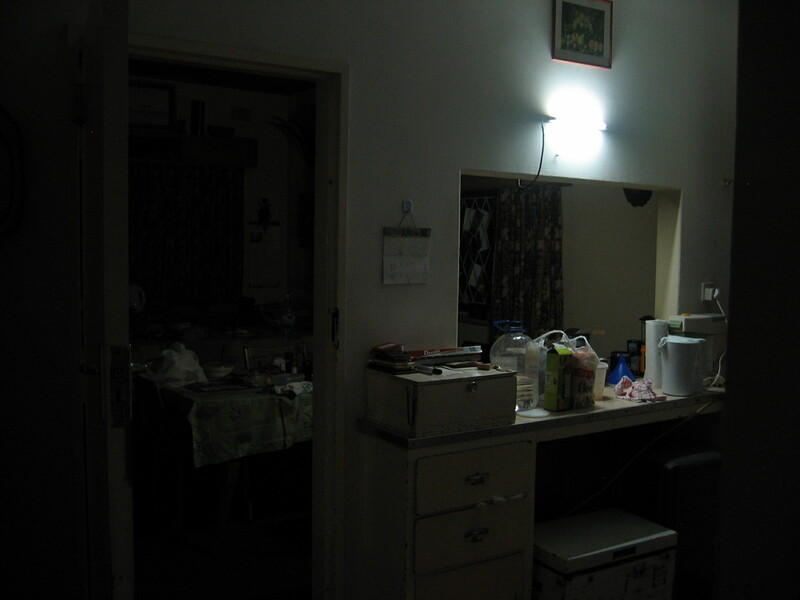 At night, Eunice brings her into the house in a covered box that is placed where the dirty dishes used to go. The dirty dishes quit going there when, one morning, Tiny was covered in ants that had been attracted by whatever deliciousness was still on the dirty plates. 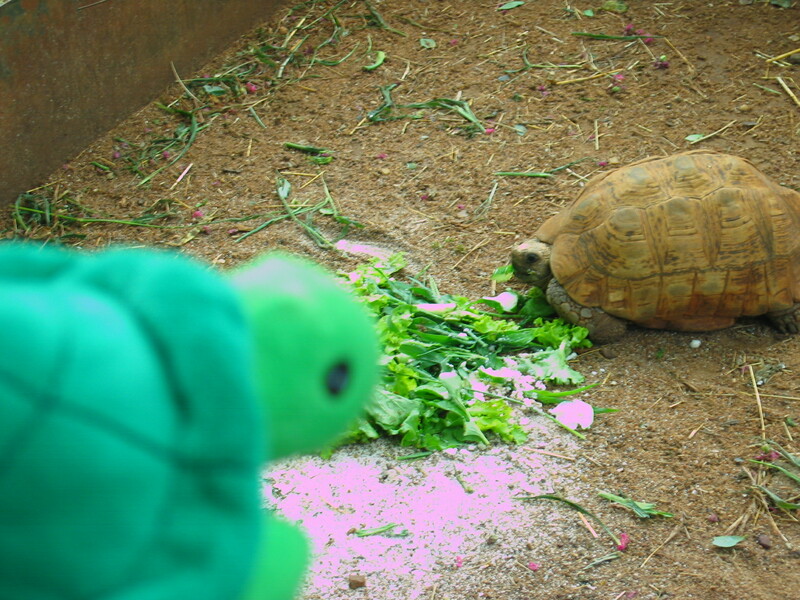 My favorite tortoise anecdote from my mother-in-law’s, involves the lettuce that she grows there that the tortoises are fed. Z-ma particularly likes rocket, and one day she suggested to Eunice that perhaps the tortoises would like it too. Eunice was dubious, took a bite of the rocket, and spit it out, saying, “No Madam, the tortoises will not like this.” And thus Tiny and her comrades were saved from having to feast on this bitter leaf. It’s different than Irish thatch and different than English thatch. I love them all. Friends anywhere are special and life is unreliable for everyone, but there is something about the tenuous nature of life in Zimbabwe that makes friendships seem more precious. Almost none of Z’s friends from his youth are still in country, and many of Z-ma’s friends and family have either left the country or have moved from her small town into the city. When we spend time with Z-ma’s friends, it seems almost holy. First, I must confess that part of my love of these friends is that they treat Z and me like rock stars. Because they know how important time with family is, they are happy that we are here with Z-ma for three weeks. But beyond feeling like we are HRH William and Kate on tour, these women are fun. They might be talking about whether or not they’ve had Zesa or their most recent fine for some made-up traffic violation, but they are lovely, funny and kind. Because I’m an introvert, I find myself shocked by how drawn to them I am, and I’m uncertain why I feel attached to people I’ve barely known and who are so different than I am. One of the few disappointments of this trip is that one of the key players has been away having those medical tests, and so we’ve missed our chance to really visit with her. 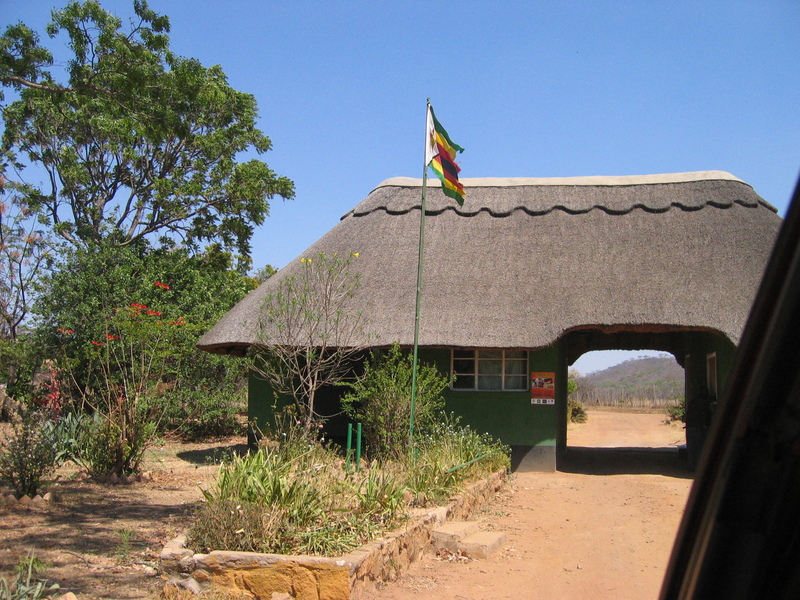 Z tells me that the Zimbabwe of his youth did not require the high grass or cement walls around a yard, topped with razor wire or bits of angry, broken glass. Intruders were rare. I assume that the walls went up during the war that waged during his childhood, but he assures me it wasn’t until much later. I find this very difficult to fathom because, though the walls can make life here seem isolated, there is a peace and privacy behind these high walls that you don’t find in many American yards. 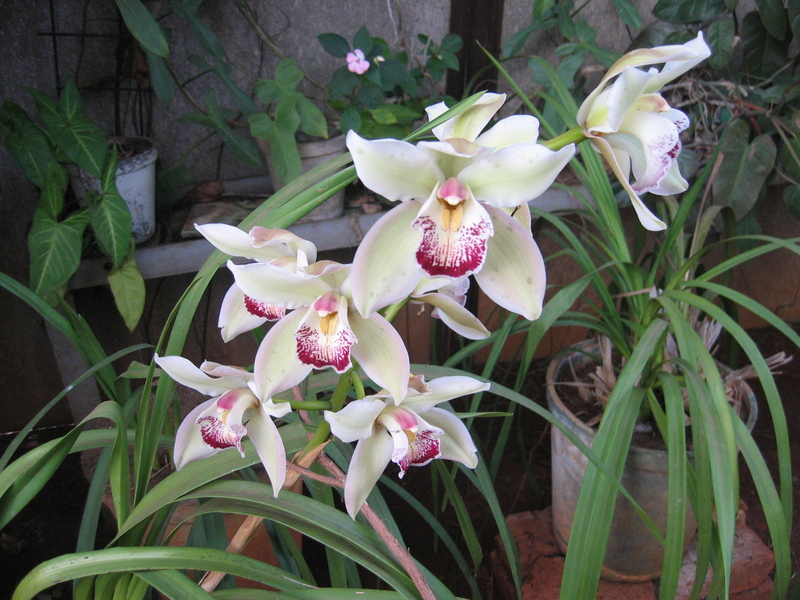 Z’s brother and family live in Harare and I was surprised by how quiet it was, how safe I felt sitting outside (with my feet soaking in a bucket of water), looking at the gorgeous flowers and plants. The outdoor spaces here are as much a part of the home as are the indoor rooms. 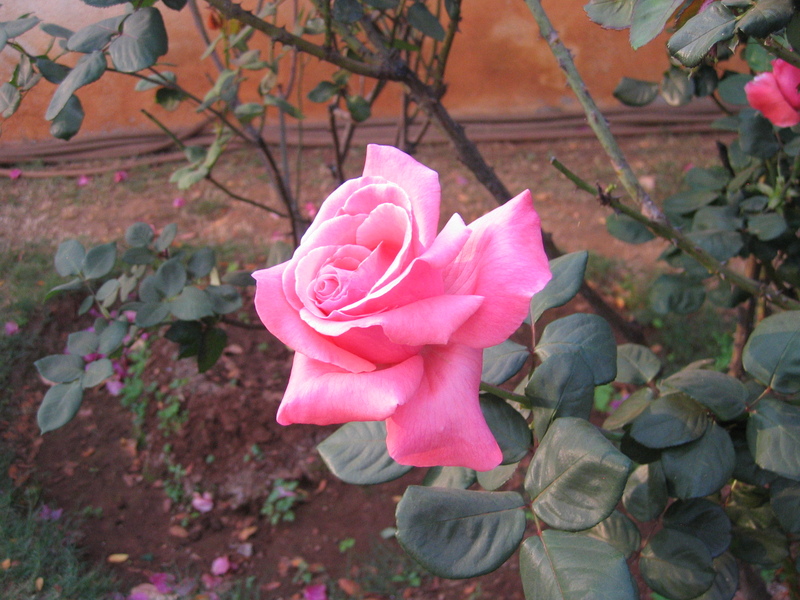 One of these roses magically appears in my bedroom on a regular basis. I like to think Z-dad and I would have had something to talk about since I’m from a town that was once the world’s largest supplier of roses. Unlike so many roses these days that are scentless, these smell wonderful. I had no idea what to expect from something called an in-law when I got married. Based on TV shows, nothing much good. 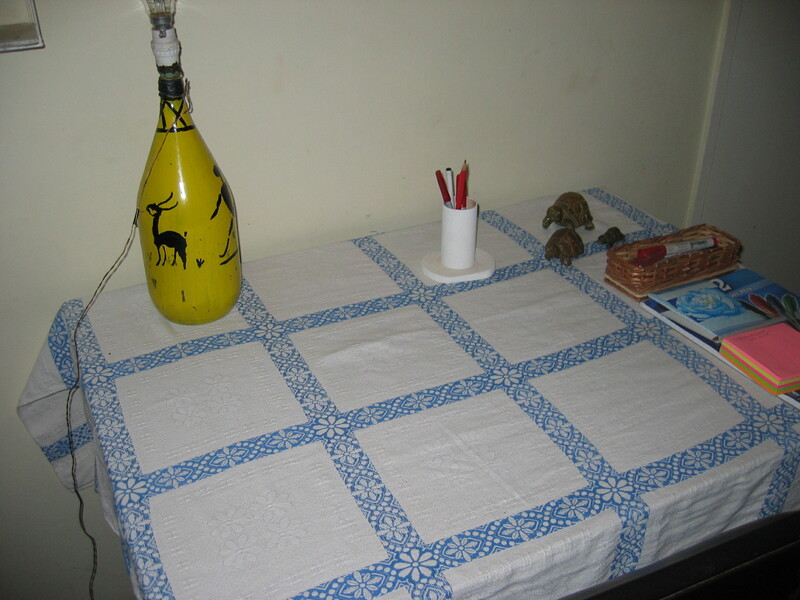 Instead, I got a woman who sneaks roses into my room, who doesn’t make me feel judged for my tedious, picky eating, and who surprised me with this writing space–Z’s old table covered with one of his beloved aunt’s table cloths. Blue is my favorite color. 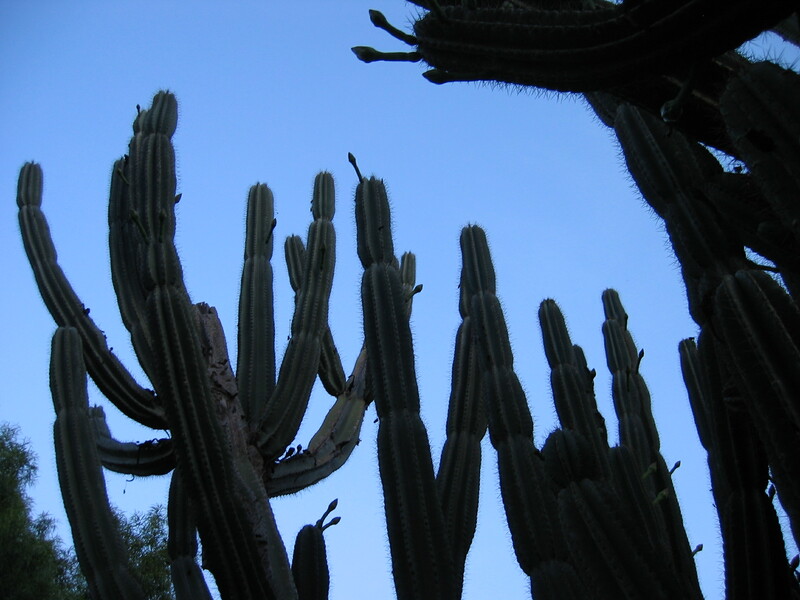 Note the tortoises in the upper right corner. First there was one and then the other two arrived. “They’re a little family,” she said. Indeed. I could compile a list of things that are my least favorite, crocodiles being at the top of the list, followed shortly by other reptiles and insects and power outages, but the truth is, even my least favorite things give me a new perspective, and it’s good to have my cage rattled. Pardon me. Z and I have to go make a plan about our last few days in Zimbabwe. 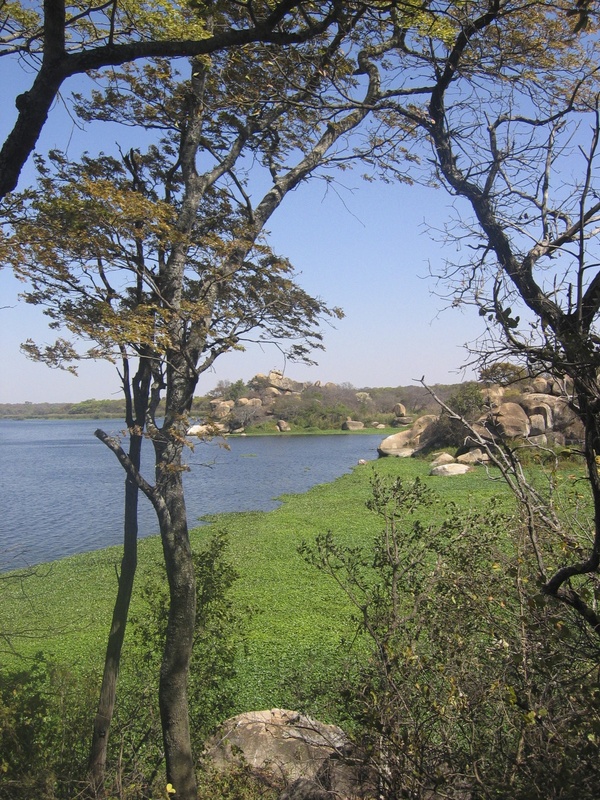 When we head to Lake Chivero, a national park outside of Harare that has been a favorite spot of Z’s family for decades, I have high hopes of seeing a rhino, despite the fact that none showed themselves when we visited on my first trip two and a half years ago. Then, it was the height of summer and everything was green and overgrown, so I left without “rhinoceros” ticked off my list but was sure I’d see one if we returned sometime in winter when the landscape is more barren, like it is now. Rhinos look a lot more like rocks than you might imagine. I think I’ve spotted about fifteen within the first ten minutes of our bumpy game drive into the heart of the park. I haven’t. What I see is only a few big roundy, rhino-shaped rocks. So much for my new prescription sunglasses. When you grow up in a land where Holsteins are easily spotted as they stand in pasture against the razor edge of a skyline, it’s a shock to realize how animals in their natural habitats blend in so seamlessly. You’d think, for instance, that a zebra would be the easiest creature to see because of its black and white stripes, or a giraffe because of its long neck, but it turns out the patterns and shapes their coats and bodies make are better camouflage than Harry Potter’s Invisibility Cloak. On the last trip, I had trouble seeing the animals at first. On this trip, I see them everywhere, only most of the time there is nothing there. At one point, I am even convinced I’ve seen one of Z and Z-ma’s beloved rock rabbits (Google it—they are more meerkat/tiny elephant than rabbit), even though they haven’t been in the park for years. 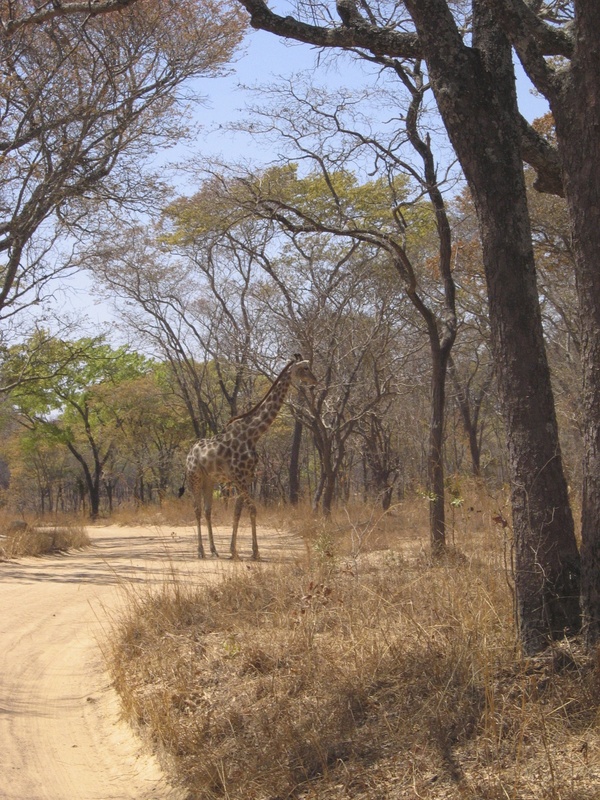 Fortunately, a giraffe has the good grace to stand in the middle of the road in plain sight, and this gets the game-sighting party started. Before long, we’ve seen about twelve giraffe, several zebra including a baby that was suckling, and a variety of buck. (I’m never excited about buck since there are approximately two deer to every one resident of Indiana, but Z’s family gets as excited about “lesser” animals as they do the Big Five, and their lack of favoritism is a quality I love about them). And then a rock moves. And the rock has a horn. And another rock with a horn. And another. While I am happy to see these rhinos (a different type has recently gone extinct because of poaching, and given the stupidity and greed of some humans, I realize how lucky I am to witness these in their natural habitat), I’d be lying if I told you I am disappointed that mostly we see the backsides of them, lumbering away from us through the tall, dry grass. 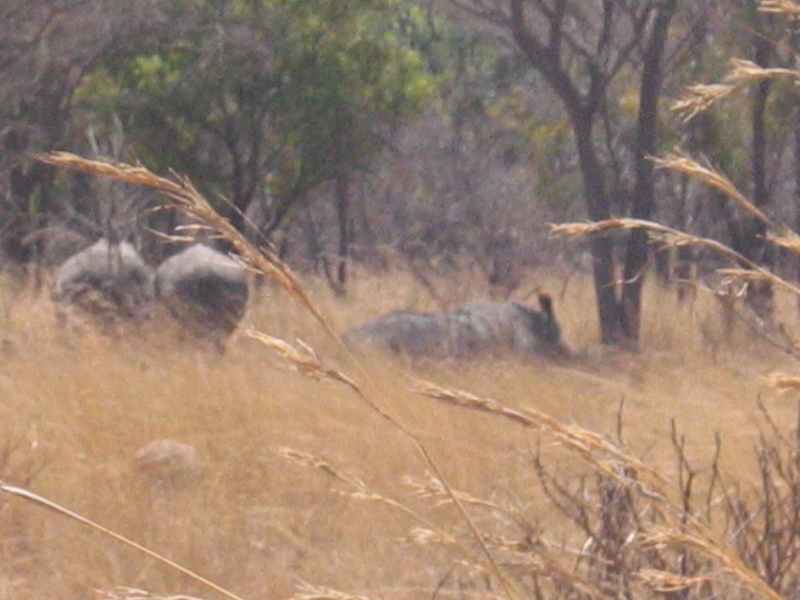 Before we leave today, we will also have added a couple of anxious looking warthogs to our list, as well as a bush pig, which I’m assured are usually hard to see. The warthogs are one of my favorites. Their tails remind me of the teasel weed that my mother used to have stuffed into a pitcher for decorative purposes, and that’s what I see first before I realize an animal is attached. We look at each other for a moment, this particular warthog and I, and then it goes skittering into the bush. We see it running parallel to the car as we drive, like it’s hoping to keep tabs on us and won’t feel safe until we’re nothing but a cloud of dust. 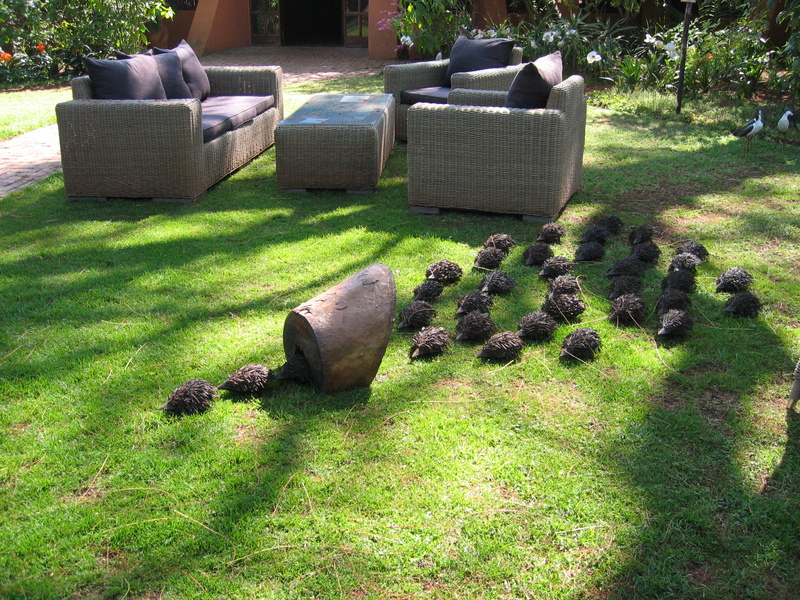 But before we see the warthog, we make our way to Bushman’s Point, our picnic destination. 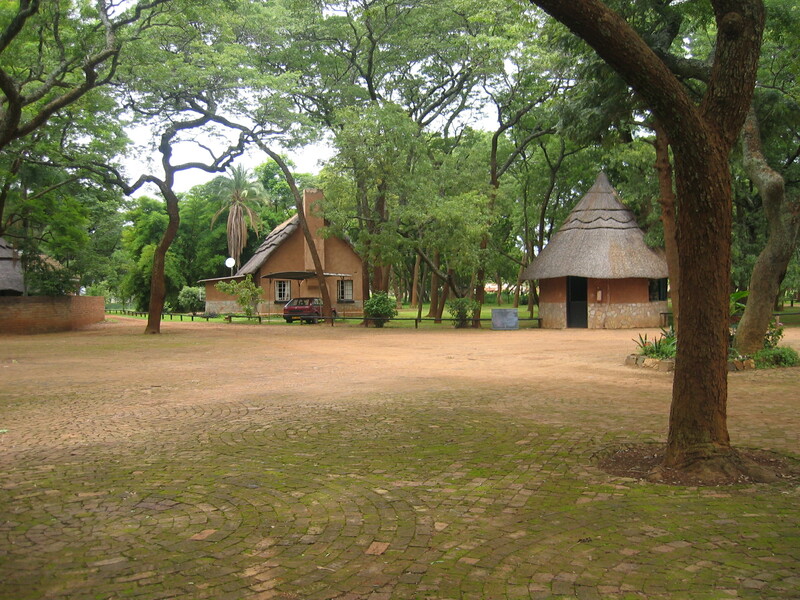 We are disappointed to see other people already there, so we situate ourselves in a less perfect picnic spot next to a thatched information kiosk highlighting the animals that are in the park and could, if they want, interrupt our lunch. Z has regaled me with tales of his niece’s birthday party here when she was little and how a monkey snatched her baby brother’s bottle. I’m keenly aware that there is no security fence between us and the animals we’ve seen on the drive, and I won’t even let myself think about how you can’t really create a snake-free zone so near a lake. Finally, I flopped myself onto the tarp with a sigh, and then the flies came. They couldn’t have had less interest in Z or Z-ma, but they were trying to fly up my nose and into my mouth. I flapped my hat at them, furiously, and realized how I looked like a caricature of an American tourist in Africa, fussing about a few pesky flies. In my defense, they were so annoying and persistent, and I was relatively certain that just before trying to crawl into my mouth they’d probably been sitting on the giant rhino poo we’d seen on the road. If we weren’t on a sort of pilgrimage, I would hop in the truck, rolled up the windows, and demand that we drive away from the rigors of high kiosk walls and overly extroverted flies. The truth is, though, I love this spot for a lot of reasons and so don’t want to leave. It’s a beautiful. Huge rocks balance on each other in impossible contortions, there’s a lovely tree canopy, and the lake is in the background. While the rest of the park looks dry and brown at the moment, the area around the lake is verdant. 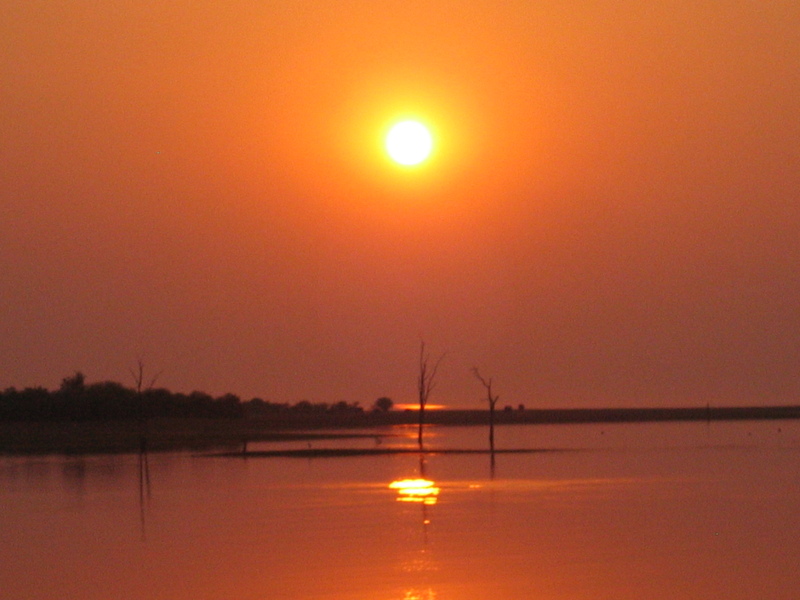 When you see water in Zimbabwe—especially in the dry season like now—it feels kind of holy. This place especially so because of the San (or bushman) paintings on some of the rocks near the water, and because Z’s father’s ashes were scattered on the lake fifteen years ago, three years before I met Z. His family has made regular trips here to celebrate his life, which to my mind is a lot less depressing than going to a cemetery because the place is alive. The walk to the water is rocky and worn. Chipped stone steps and pathways leave me lumbering like a bear, and huffing and puffing like an asthmatic, which I wouldn’t feel so bad about if Z-ma, who has almost three decades on me, weren’t navigating the path better than I am. We stop when we are almost at the water and Z tosses some rose petals on the wind near a tree where his aunt’s ashes were scattered a few years ago. Z-ma says hello to her younger sister, using a pet name, and we move on. We stop next at the San paintings in a recess in the rocks. They’re behind a fence, but close enough that I could touch them if wanted to. 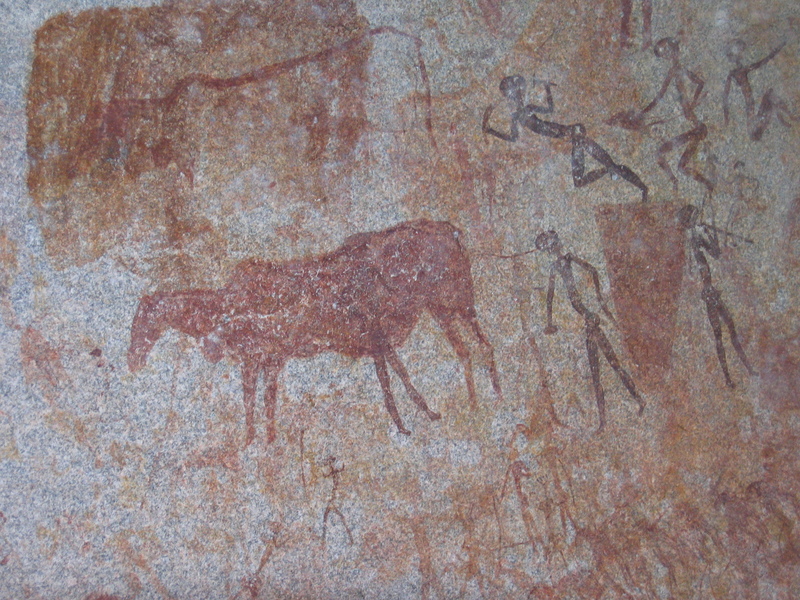 When I see the reddish pigment on the canvas of the rock, I have a lot of questions about who they were and the meaning of life and what I would have done if I’d been born a hunter-gatherer, since I can’t handle the insects, rough terrain, lack of indoor plumbing, or, let’s face it, lack of indoors period. Looking at the paintings, I feel the way I did when I first saw Stonehenge or Poulnabrone dolmen in Ireland, which is to say, I can’t take it in in any sort of satisfactory way. It is too huge a thing to contemplate. Finally, we move on to the cement jetty, where Z and Z-ma cast their petals onto the water, and I stand back, wondering what the appropriate way is to mourn or offer homage to a man I’ve never known. Though I don’t feel it here, when I am back at Z-ma’s, I’m very aware of Z-dad’s absence and what I’ve missed out on by nature of having come to the family too late to meet him. At the house, I look at his rose bushes, the structures that used to encompass an aviary, the now irretrievably empty pool where two proud-looking lions used to spit streams of water. At night when we watch the one channel of TV that Z-ma manages to get, Z sits in his dad’s old chair, and I can imagine his father sitting there, even though my vision of him is only a guess, based on what I’ve seen in photos and what I’ve sussed out by watching Z and his brother: how they speak, the way they hold themselves, their strong senses of self. It’s another mystery I can’t solve, and so after a few moments, I get distracted by lizards, sunning themselves on the rocks.